There are many reasons that there should be an indictment to send Brown’s killing to a trial. After the shooting, Wilson removed evidence by washing the blood of his body before there was any investigation. His actions allowed the spread of rumors about the extent of his injuries. Wilson’s gun was not tested for fingerprints, allowing Wilson to claim that Brown had grabbed the gun. In fact, Wilson didn’t immediately turn over his weapon to investigators. He left it in his holsters, took it back to the station, and put it in an evidence bag himself. The shooter was the last person with chain-of-custody control of the murder weapon. The first officer who interviewed Wilson took no notes; he gave testimony over a month later from memory. The interview came after Wilson was taken to the hospital. “I didn’t take notes because at that point in time I had multiple things going through my head besides what Darren was telling me,” the officer stated. Wilson changed his story between the first interview and later testimony. Originally, he said he didn’t know that Brown may have been a suspect in a theft from the local liquor store. In the original interview, he said he didn’t know that Brown gave to Dorian Johnson but later reported that he saw the cigarillos, leading him to believe that Brown was the thief. McCulloch demonstrated a possible conflict of interest. As president of The Backstoppers, Inc., he was involved in fundraising for Wilson with a T-shirt drive featuring a picture of Missouri with the statement “I SUPPORT OFFICER D. WILSON” to raise money for the Darren Wilson Defense Fund. The exception to these statistics is police shootings. A recent Houston Chronicle investigation found that “police have been nearly immune from criminal charges in shootings” in Houston and other large cities in recent years. In Harris County (TX) grand juries haven’t indicted a Houston police officer since 2004; in Dallas, grand juries returned on indictment out of 81 reviewed shootings between 2008 and 2012. McCulloch set up the grand jury for no indictment when he presented “all evidence.” The usual procedure is to present only evidence necessary to establish probable cause. McCulloch also allowed Wilson to testify for hours in defense of his actions. The DA admitted his team acted in Wilson’s defense when he said that prosecutors “challenged” and “confronted” witnesses to discredit their accounts. At the very least, Wilson should have been indicted for negligence, based on documentation. McCulloch, however, had given no instructions to the jury. He just presented the case like any defense attorney would, adding a tremendous amount of non-related material. Not considered by the grand jury was whether Wilson could have avoided killing Brown. The “de-escalation” training in other parts of the country has reduced the unnecessary use of force and improved safety for both officers and civilians. De-escalation means that multiple officers respond because of just one person, calmly introducing oneself, listening, and using body-worn cameras that helps both officers and civilians to behave better. Instead of waiting for backup, Wilson got out of his car and pursued the Brown after stopping him for jaywalking. As a police officer, Wilson had a nightstick, mace, gun, and self-defense training. The question is why he would leave his car without backup and chase a man who terrified him. The social media is not the only source of discontent in the way that McCulloch handled the case. The National Bar Association has released a statement pointing out the flaws in how the AG handled the case. It is pushing for the Department of Justice to continue its own investigation. Past events have shown police that they can harass and bully people—especially blacks—with no retribution. The lack of indictment in the Ferguson case reassures police that they can continue to do so while the false information distributed to the public makes people comfortable with this, and future, killings. Ben Carson, the first person to become a 2016 GOP presidential candidate, blames the women’s liberation movement for Brown’s killing. According to Carson, women are incapable of teaching their children to respect authority. The result is a high number of black youth killed by police or incarcerated. 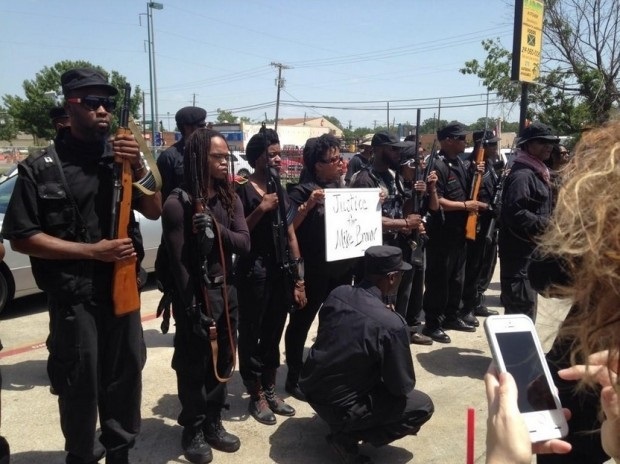 He believes that Michael Brown could still be alive if we women had not fought for our rights. Warning: Caron is a neurosurgeon. Anyone seeing him professionally should be warned to get a second opinion. There certainly should be a second opinion on the grand jury that failed to indict Darren Wilson. Marquis was in foster care before his great-grandmother took custody of him when he was two years old. She took him with her when she went to vote, and he said he began to think about politics when he was five. Marquis is one of those people who can make a difference—if he lives long enough. People want to think that we live in a “post-racial society” because those who attempted to quiet the Ferguson protests- the Missouri highway patrol commander, the U.S. attorney general, and the president—are black. Yet millions of blacks are blocked from achieving this high level through failed schools, lack of high-paying blue-collar jobs, and racial bias in arrests and imprisonment. Brown had managed to graduate from high school with no police record and head to technical college. A police officer stopped him for jaywalking and then ran after him and killed him. That’s what happens to many young black men in the United States. Brown is dead, and Wilson was not punished. How can anyone be surprised that the end result is rage? Initially Assistant District Attorney Kathy Alizadeh told the jury to base their decisions on a law that was ruled unconstitutional almost 30 years ago. She told the jury that Wilson had the legal right to shoot and kill Brown as soon as Brown ran away from the police officer, that Wilson could legally do this even if he didn’t feel threatened. The U.S. Supreme Court had ruled unconstitutional any law stating that an officer is “justified in the use of such physical force as he or she reasonably believes is immediately necessary to effect the arrest or to prevent the escape from custody.” Alizadeh failed to make any correction to these instructions for two months and then was extremely vague, saying only that “the statute in the state of Missouri does not comply with the case law.” When a juror asked if “federal court overrides Missouri statutes,” she said, “Just don’t worry about that.” Assistant prosecutor Sheila Whirley added, “We don’t want to get into a law class.” There was no explanation of what was incorrect about the unconstitutional law that she had given them. This mistake greatly contributed to Wilson’s exoneration. The case in front of the grand jury was not about the dead person, Michael Brown. Yet on the first day of testimony, McCulloch referenced only Michael Brown—four times—while making no mention of Darren Wilson, the man who killed Brown. The first mention of Wilson came from a witness, on-scene medical examiner Sheila Whirley. The prosecutor spent time discussing Brown’s tattoos, clothing, etc., anything that would present the victim as a social reject, but avoid any mention of homicide. The questioning appeared to be focusing on the indictment of Michael Brown. According to Justice Antonin Scalia, in the 1992 Supreme Court case of United States v. Williams, “the suspect under investigation by the grand jury [has not] ever been thought to have a right to testify.” Yet McCulloch allowed Wilson to testify for hours before the grand jury and presented them with every piece of exculpatory evidence available. McCulloch erroneously told the grand jury that an indictment required them to “find probable cause” that Wilson “did not act in lawful self-defense” and that he “did not use lawful force in making an arrest.” Because several eyewitness accounts indicated that Wilson was not acting in self-defense when he killed Brown, McCulloch should have presented this evidence, likely returning an indictment in days rather than a lack of one in months. Wilson said that Brown looked “like a demon” and felt like a “5-year-old holding onto Hulk Hogan.” Both men are the same height although Brown is heavier than the police officer. Wilson’s testimony described himself as being almost pleasant when he asked the two young men to move to the sidewalk. He also claimed that he suspected Brown had stolen the cigarillos. After Wilson fired two shots, Brown ran away before Wilson pursued him and shot him in the head when he was 8 to 10 feet away. Evidence indicates that Brown was actually about 148 feet from Wilson when the last shots were fired. Wilson testified that Brown handed cigars to his friend Dorian Johnson at the same time Brown was allegedly hitting Wilson in the face with the same hand. “When I start looking at Brown, first thing I notice is in his right hand, his hand is full of cigarillos,” Wilson said. Asked later which hand Brown used to hit him, Wilson said the right hand. Johnson said that Wilson grabbed Brown by the neck through his car window although Wilson said that he grabbed his arm. Brown reportedly struck Wilson before he unholstered his gun. Wilson’s face didn’t show the wounds that such a confrontation would cause. He never had damage to his “orbital eye socket”—just a bruise and a slightly reddened area. Even Wilson admitted that Brown had his hands in the air when he came back toward Wilson. Wilson said he fired his gun in self-defense because Brown assaulted him through an open window, yet police officers reported that the front driver’s side window was shattered outward and blood was on the outside of the vehicle. In addition, Wilson claimed that he fired two rounds from inside the car, but one of the empty shells was outside. The released documentation from the grand jury contains no copy of Wilson’s police record about the event although the police officer gave three different narratives about what happened. The prosecution told witnesses that they could not compel them to testify. The power of the subpoena actually gives the prosecution this power. McCulloch introduced the officer defendant as a witness “against” the officer in a violation of both the U.S. and the Missouri State Constitution, the right of due process, and both U.S. and Missouri codes. In his press conference, Robert McCulloch said that the grand jury disregarded testimony from witnesses that didn’t match what he perceived as the facts of the case. The question is which testimony. The PBS Newshour analyzed over 500 pages of transcripts and created a chart of responses. Over half the witnesses said that Brown had his hands raised when Wilson shot him. Only five people said that Brown reached for his waist. Over half said that Brown was running away when Wilson shot him, compared to the 20 percent who disagreed with this statement. 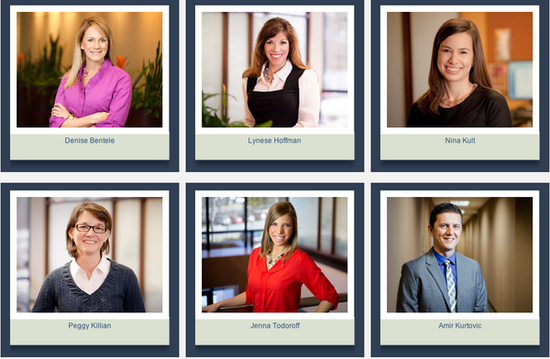 Ordinarily such diverse testimony would send a case to trial where it could be examined. During his announcement about the results of the grand jury, McCulloch cited the reason for Wilson’s encounter as theft of cigarillos. 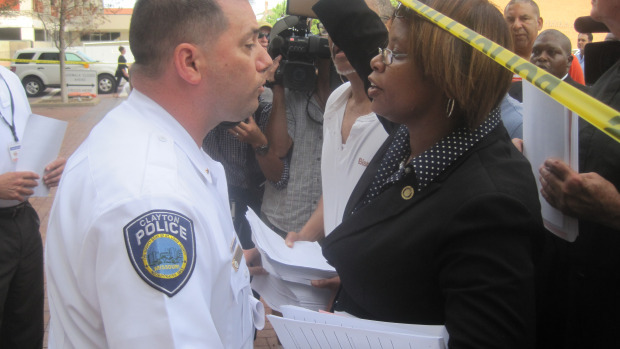 Both the police chief and the caller dispatch disagreed with McCulloch’s claim. According to the attorney for the store where Brown allegedly stole the cigarillos, neither the owner of the store nor its employees called police to report any shoplifting. The police did not see any video of the action until after Brown was killed. The conservative media had dredged up photos of other people badly injured and in the hospital, purporting these men to be Darren Wilson. 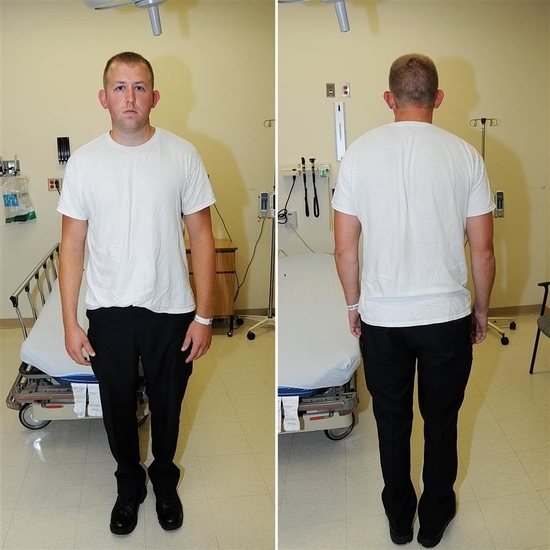 According to the released documentation, these photos of Darren Wilson were taken at the hospital following the shooting and show no injuries. Three witnesses who testified before the grand jury were medical examiners. Only one of them came to the crime scene, and he didn’t arrive for at least three hours after the shooting while Brown lay in the street in the August heat. The ME took no photographs because the battery in his camera was dead, and he failed to take any measurements. He said he didn’t need to because “it was self-explanatory what happened. Somebody shot somebody.” He also failed to have any equipment to make any measurements. Correction: The above reflects that Wilson’s testimony is constitutional but highly unusual. The defendant lacks the constitutional right to testify or have exculpatory evidence presented to the grand jury. When he failed to feed the racist watchers, however, they turned on him. His support for President Obama’s executive actions on immigration led to racist, violent messages on Rivera’s Facebook page. He shouldn’t hold his breath to see what Fox does. As for Facebook authorities, he’ll find out that there are none. Rivera has discovered on a personal level the backlash from viewers who believe they are entitled to the hatred that Fox has promoted during the past few decades. 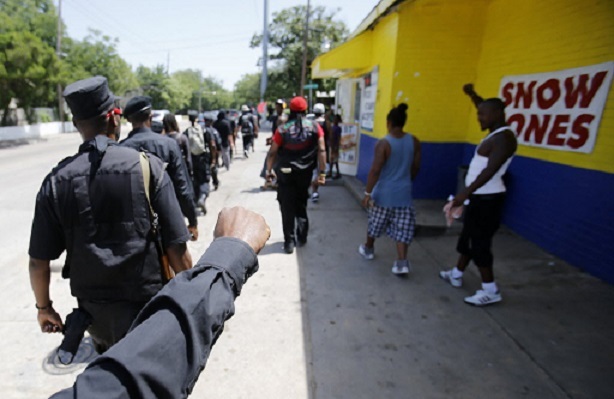 This backlash is a minor blip when compared to the release of the grand jury findings of Michael Brown’s killing in Ferguson (MO) on August 9, 2014. Part of his speech focused on the hard work of the grand jury as they “gave up their lives” while deliberating. Sounding like a defense attorney, he indicated that Wilson knew Michael Brown had stolen cigars from a convenience store before the shooting, but Ferguson Police Chief Tom Jackson stated that Wilson was not aware that Brown was involved in any alleged robbery. The only charge against Brown every publicized was that he was in the middle of the street—apparently against the law in Ferguson. The question that this discrepancy raises is how many others exist. Even the timing of the press conference was peculiar. McCulloch waited all day until 9:00 in the evening to announce the grand jury’s findings. “It was with sadness and growing anger that many in our community at Union Theological Seminary in the City of New York took in today’s news out of Missouri. While we cannot claim to know all that led to the decision, we are deeply concerned about all it implies about our nation and the violence that lives with us. “The state-sanctioned violence perpetrated against young men of color in this country is abominable. It is cruel and sadistic, and undergirding it is the scourge of white racism with the myriad privileges and fears attached to whiteness. “The brutality of racism and the harms it inflicts on black and brown bodies directly contradicts every tenant of our Christian faith — indeed, the tenets of all the world’s major religions. Until it is addressed directly and with sustained commitment by all of us, we will repeatedly fail to be the country we dream of being. “We must not turn back from facing this harsh truth. “As John F. Kennedy cautioned years ago, ‘Those who make peaceful revolution impossible will make violent revolution inevitable.’ We are committed to peaceful change, and we confess that our democracy is so profoundly broken that nothing short of a people’s movement for deep, systemic change can fix it. “We are hopeful that out of our anger will continue to spring forth activism rooted in a faith bigger than any one community. We remain firm in our belief in a God that gives life and seeks goodness in all things. Using the fierce, biblical model of love and non-violence claimed by our forbearers, we stand evermore committed to working together for real change. We can only hope that memories of this disaster will lead to positive change instead of fading away like the other horrific events of the past. Tomorrow, however, Rivera can go back to blaming another black teenager for being killed. Much has been said about the political situation in Ferguson (MO), but a huge problem lies in the schools. GOP legislators have cut trillions of dollars from budgets through massive tax cuts for wealthy people and corporations while spending more trillions on George W. Bush’s manufactured wars. Transferring federal fiscal obligations to states left them unable to fund their responsibilities. Problems in badly underfunded schools were exacerbated by punitive measures for artificial evaluation. Ferguson is a prime example of the GOP approach toward educating young people in the nation. A remembrance of Michael Brown, the slain teenager, highlights our country’s low regard for educating its youth. Despite great disadvantages, Brown earned his diploma nine days before he was killed. He was scheduled to being schooling at a vocational school specializing in air conditioning and heating just a short time after he was murdered. Brown’s graduation photograph was taken almost four months before he graduated because Normandy High School owned only two graduation gowns for the entire class. Two students would wear the gowns at one time, sit before the camera for their graduation portraits, and then pass the gowns on to the next two students. Needing more credits, Brown didn’t graduate with his class and went to summer school to earn his diploma. Brown’s school district was formed by combining Normandy and Wellston districts. The poverty rate for families at Normandy was 92 percent; at Wellston, it was 98 percent. Every student at Wellston was black. Wellston, one-tenth the size of the almost 5,000-student Normandy, had been unaccredited for seven years; Normandy was on provisional accreditation for 18 years. The state education board voted to merge these two districts in 2010, the first time that it changed school districts in 35 years. White flight in the districts had crashed property values and destroyed tax revenues. Better-off residents in the districts sent their children to private schools. To support the school, residents kept voting to raise their own property taxes, resulting in the highest rates in the state, but district revenues kept decreasing. In 2012, the state board rated Normandy as a failed district, removed its accreditation, and put it under direct state control. Although the purpose was to redesign the district, the state Supreme Court ruled in 2013 that students in a failed district could go to other districts. Hundreds of Normandy students transferred to other districts, some of them majority white. Their fears did not come to fruition, and Francis Howell found that the 400 students who transferred into their district worked well with the other students. Normandy, however, suffered more financial problems because it had to pay for transportation and tuition to the districts where students transferred. Those who stayed at Normandy held pep rallies and welcome-back-to-school gatherings; students tutored each other to improve the school’s academic ranking. They said that there was a sense of optimism despite the deprivation of resources. Normandy no longer had any legal rights because it wasn’t a district. According to the state board of education, it was a special collaborative and “not in any district in this state.” The Normandy school district was now run by the president of the state board of education, Peter F. Herschend, of Branson (MO). With no background in education, he owns Herschend Family Entertainment which runs Silver Dollar City and other amusement parks. He is also one of the biggest contributors to the Republican Party in the state. The person in charge of Michael Brown’s school district, an urban, minority district so poor that students have only two graduation gowns to share, was a white Republican millionaire who lives over 200 miles away. No one knows what will happen now. There may be appeals, or students may be able to transfer to other schools. No matter what, this is the state of education in one state—and may be better than in other states. Sixty years after the ruling in Brown v. Board of Education was intended to stop school segregation, schools are more segregated than ever—and segregated economically as well as racially. A new report from the Economic Policy Institute shows the isolation of black youth. Court orders to integrate have mostly been lifted, many of them during George W. Bush’s terms, leaving schools to re-segregate. For example, Tuscaloosa (AL) had a thriving, demographically mixed high school until the integration mandate was lifted. White parents lobbied for districts to separate white and black students. In a classic case of haves and have-nots, black neighborhoods have fewer primary care physicians and fewer grocery stores, and children growing up are more likely to be exposed to lead paint and to have asthma. Parents work less-flexible jobs with less time to foster learning by taking their children to zoos, libraries, and museums. Before kindergarten, minority kids are behind, and few of them ever catch up. Teachers in schools with the neediest students are usually the least qualified. Young people in poor schools lack the resources that booster clubs and PTA funding in advantaged schools provide, and every year lack of funding requires parents to fund more and more things that taxes used to provide. Yet the poverty of many minorities demand greater resources than middle-class white students need in order to achieve success. We are a country of elitist education, and Ferguson, Missouri, is an example of what happens because of this inequality. 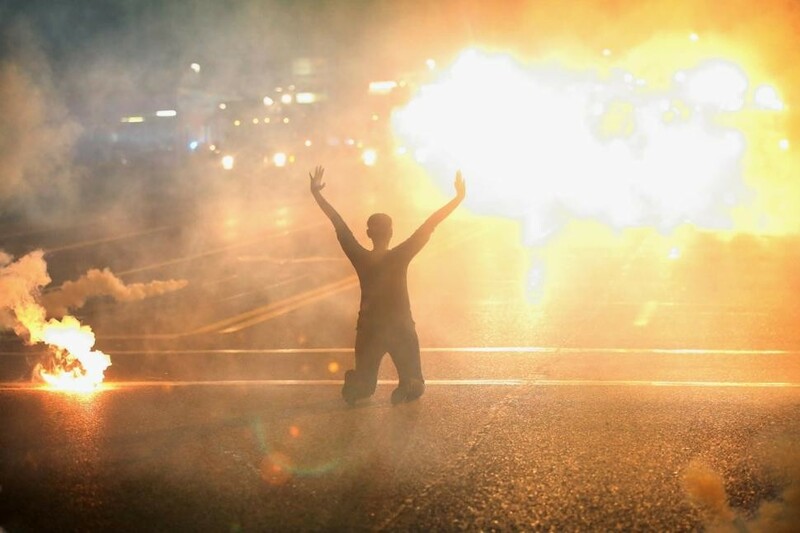 Ferguson, Missouri, is a suburb of St. Louis. Two-thirds of its population of 21,203 is black, but four out of five city council members are white. The black superintendent of schools was forced out for unknown reasons last November and replaced by a white man. Of the 53 police officers, 50 are white, yet blacks account for 93 percent of the arrests. Of the 54 police officers, 52 of them are white. As Rachel Maddow pointed out in this video, the police officers’ prejudice against people of color in this town has been rampantly open for many years. The situation came to a tipping point four days ago when a town police officer killed Michael Brown, an unarmed teenager, possibly by shooting him in the back ten times. When people gathered in protest after the teenager’s killing, police fired tear gas at them, sometimes when people were standing in their own backyards. The FAA banned air travel under 3,000 feet over the town from August 12-18. Yesterday morning, police claimed that the man who was shot and critically wounded by a St. Louis County police officer had pointed a handgun at the officer. A woman was also shot in the head and wounded. 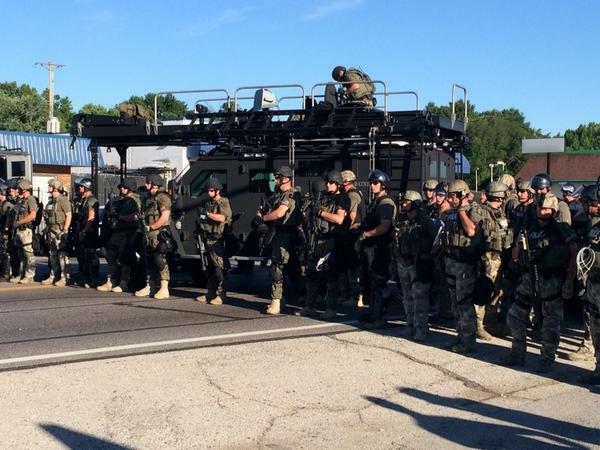 Looting has been reported, but townspeople say that these are not by Ferguson’s residents. These photos show the police in this small town. Witnesses to the killing say that Brown and a friend were stopped by a police officer for walking in the middle of the street. Brown’s hands were in the air when the last shots were fired, according to the witnesses. Police claimed that Brown was fighting over the officer’s gun. The federal government sent billions in surplus military equipment during the wars in Iraq and Afghanistan to state and local police departments. Since 2006, they have acquired 435 armored vehicles, 533 planes, 93,763 machine guns, and 432 mine-resistant armored trucks–$4.3 billion worth of equipment. 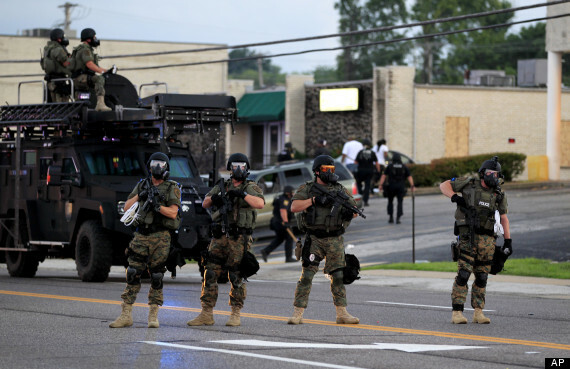 Military equipment in these police agencies increased from $1 million in 1990 to almost $450 million in 2013. With all this hardware, police departments are looking for more reasons to use SWAT teams and other heavy-handed tactics. Search warrants seem to be a good excuse; 79 percent of SWAT deployments from 2011 to 2012 are for this purpose. The result is sometimes death, as in the case of Aiyana Stanley-Jones, a seven-year-old killed during the SWAT team attempting to deliver a search warrant in Detroit. Recruiting videos for SWAT teams feature images of officers “storming into homes with smoke grenades and firing automatic weapons,” according to The New York Times. 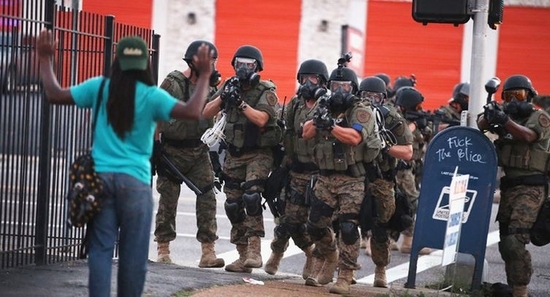 SWAT teams resemble occupying forces and enact repressive, punitive policing. Police have attempted to keep media out of Ferguson. St. Louis Alderman Antonio French wrote, “A line of police cars with high beams on greets anyone trying to enter #Ferguson. It’s shut down. No media allowed.” Two journalists, Ryan J. Reilly of The Huffington Post and Wesley Lowery of the Washington Post, were arrested. Although both of them were released unharmed, they were roughed up as they sat working in a McDonald’s. Reilly reported that the restaurant was quiet until the police officers came in. Lowery had just filed this story when he was arrested. The police requested people to disperse at dark, but the town has no legal curfew. Snipers pointing their guns at unarmed civilians throughout the afternoon. As I write this, police are firing tear gas canisters into the crowds who are using the hands-up signal of “don’t shoot.” It looks like a war scene out of Iraq. Otherwise, there’s little news coming out of Ferguson. The police have said they will not release the name of the police shooter—although many people know the name in this small town—and will not reveal any other information until after the toxicology report which could take at least four weeks. 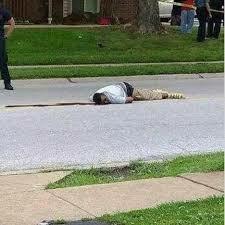 Although the Ford shooting generated very little media notice, the killing of Michael Brown has gone around the world. The difference is that people protested. It’s time for us to worry about the injustices in the United States as well as in other countries. Before I continue with Part Two of the Bain Capital debacle, I want to say how sad I feel for the devastation of Hurricane Sandy, both in the Caribbean and in the United States. In addition, I am grateful for the speed with which government has moved to keep the storm’s effects from as much tragedy as possible. In watching all the work that has been done to save people’s lives and make their lives a bit better, I am also angry at the outrageous comments made by Michael Brown, head of FEMA largely responsible for the disaster in New Orleans following Hurricane Katrina and now a radio host in Colorado. From his safety on the other side of the country, he criticized President Obama for moving too fast. Yesterday he talked about how New Yorkers were saying that the storm, Sandy, isn’t a big deal. The people hit by Sandy are indeed fortunate that he is no longer in charge of government emergency assistance. The same people are also fortunate that the United States has a president who believes that government should help people in need after such an act of nature. Mitt Romney not only said in the primary debates that the federal government, and probably the state governments, should have no part in emergency aid, he also refused to answer any questions today—14 times after one interview–about how he sees the role of FEMA. During the 1980s, Romney managed to get lots of cigarettes into Russia. Bain & Co.—and Romney–worked with British American Tobacco (BAT), which is behind brands like Kool and Lucky Strike, to move their products into Russia. Before Bain, BAT was largely locked out of the Russian market; now it controls almost one-fourth of cigarette sales that have skyrocketed since the Soviet Union collapse. Then Bain moved into the U.S.; a month after Romney took over, the first got a $1 million contract with Philip Morris. Romney clearly described Bain’s goal in 1985: its purpose has never been to create jobs; its purpose is to “harvest” companies. The most recent harvested company is moving into China right before this year’s general election. Although Romney is no longer active in Bain, he’s still reaping the benefits from moving Sensata Technologies from Freeport (IL) to China. The company made record revenues last year, and workers have been working three shifts for 24 hours a day. They make $14-$17 per hour with benefits. The first thing that Bain did after buying the company was to organize its capital funds in the Cayman Islands so Bain could avoid paying taxes on these funds. Now Bain will get money for relocating the plant offshore while U.S. taxpayers have paid $780,000 to retrain some of Sensata’s fired workers. Romney has a history with Bain and China. In 1998, when he was running Bain, he saw the horrible conditions of workers making $.24 an hour at the Global-Tech Appliances plant in Dongguan and invested millions in the firm. But he could make money by exploiting these workers. Romney’s experience with Bain makes him uniquely unqualified to be president of the United States. In campaigning he said, “A prairie fire of debt is sweeping across Iowa and our nation. Every day we fail to act, that fire gets closer to the homes and children we love.” Our collective debt is no ordinary problem: According to Romney, the debt will “burn our children alive.” Yet he made his personal fortune by borrowing vast sums of money that other people were forced to pay back. His experience with Bain shows that he is one of the greatest and most irresponsible debt creators of all time, piling more debt onto more unsuspecting companies and writing more gigantic checks that other people have to cover than perhaps all but a handful of people on planet Earth. A private equity firm like Bain typically finds floundering businesses with good cash flows. It puts down 10-30 percent of its own money and then borrows the rest from a large bank to buy a controlling stake in the company. Bain avoided the hostile takeover, done without the company’s consent, by buying off the management with huge bonuses. The takeover companies, including Bain, aren’t on the hook for the debt; the company they purchase is. That company is destroyed by just the interest they have to pay, either going bankrupt or slashing benefits and firing workers. Then Bain can swoop in and purchase the company for pennies on the dollar, the vulture approach. In the business world, lying and changing positions is praised because it makes money. Romney seems genuinely puzzled by the public’s insistence that he be consistent. “I’m not going to apologize for having changed my mind,” he’s fond of saying. But that doesn’t translate into successful leadership of a country. And it’s all legal. The entire business of leveraged buyouts wouldn’t be possible without a provision in the federal code that allows companies like Bain to deduct the interest on the debt they use to acquire and loot their targets. And he couldn’t pay such low taxes if it weren’t for the same tax code. Romney rails against the national debt at the same time he exploits a tax deduction specifically designed for mortgage holders. He bilks every dollar he can out of U.S. businesses before burning them to the ground. Romney also shows his lack of ethics in his tax avoidance strategies. He used a loophole to “rent” the Mormon church’s tax exemption status and defer paying taxes for 15 years. Bloomberg News reported that Romney set up a charitable remainder unitrust (CRUT) in June 1996 just before Congress cracked down on the loophole in 1997. “In this instance, Romney used the tax-exempt status of a charity — the Mormon Church, according to a 2007 filing — to defer taxes for more than 15 years,” Bloomberg’s Jesse Drucker explained. “At the same time he is benefiting, the trust will probably leave the church with less than what current law requires.” The amount available to go to the Mormon Church has decreased from at least $750,000 in 2001 to $421,203 at the end of 2011 as Romney has collected yearly cash payments from the trust. Although a small amount when compared to Romney’s fortune, he has many other methods of avoiding taxes. Much later George Romney received welfare from the federal government. According to his wife,Lenore Romney, [George Romney] was a refugee from Mexico. He was on relief, welfare relief for the first years of his life. But this great country gave him opportunities.” Romney is unwilling to give anyone else the same opportunities that his family had. The Olympics is a classic example of Romney’s hypocrisy. While describing his magical leadership to save the faltering Winter Olympics in 2002, much of his success came from the $1.5 billion that he took from the federal government, an amount 1.5 times the amount, adjusted for inflation, spent by the federal government to support all seven Olympic games in the United States back to 1904. These expenditures averaged $625,000 in taxpayer money for each athlete, an increase of 5,582 over the $11,000 average at the 1984 games in Los Angeles. Even Sen. John McCain pointed out that at the time that this was a bailout. Donald Barlett and James Steele reported that “wealthy Utahans used the games as an excuse to receive exemptions for projects that would otherwise never meet environmental standards, or to receive generous subsidies for improvements of questionable value to the games—but with serious value to future real estate developments.” bailout. Romney has always been clear about all his priorities. The Salt Lake games came just months after 9/11. When a representative of widows and orphans whose husbands and fathers were firefighters killed in the terrorist attack inquired about free or discounted tickets to games, Romney twice denied the request, saying that there was a policy against giving away tickets. Six weeks later, Romney offered a hundred tickets, valued at $885 each, free to Utah legislators. Romney has always used Bain to justify his ability to become president instead of his time as governor of Massachusetts. During his one term the state ranked 47th in job growth; suffered the second-largest labor force decline in the nation with only Louisiana greater because of Hurricane Katrina in 2005; lost 14 percent of its manufacturing jobs, double that of the nation at the time perhaps because he vetoed legislation that would have banned companies doing business with the state from outsourcing jobs to other countries; experienced “below average” economic growth and was “often near the bottom”; and piled on more debt than any other state despite his raising fees while he was in office. That’s what would happen to the United States if he were to be elected—or appointed—president.